Haitians are facing a Herculean task: rebuilding their country following a devastating earthquake. 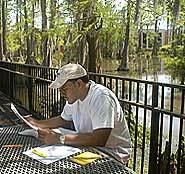 Municipal leaders are turning to their counterparts in French-speaking communities — and to the University of Louisiana at Lafayette — for information and guidance. On Jan. 12, the epicenter of the 7.0 magnitude quake struck Haiti’s most densely populated region, near Port-au-Prince. At the time, about 2 million of the country’s almost 10 million citizens were living in or near the nation’s capital. The Haitian government estimates that 230,000 people died as a result of the quake. Seventy percent of the buildings in Port-au-Prince were damaged or destroyed, including government buildings, schools and hospitals. Six months later, there are few signs of recovery, according to a June 22 report by the U.S. Senate Committee on Foreign Relations. Buildings still lie in ruins, rubble blocks streets. Millions of displaced residents are living in tents. In mid-June, about 30 Haitian mayors attended a conference in Lafayette focused on rebuilding strategies at the municipal level. The international workshop, “Reconstruction of Cities for a Lasting Development: Challenges and evaluation of practices of reconstruction,” was hosted by Le Centre International de Lafayette, Lafayette Consolidated Government’s international trade division. Joey Durel, LCG’s city-parish president, is a member of the Association Internationale des Maires Francophones (the International Association of Francophone Mayors), which sponsored the conference. Philippe Gustin, director of Le Centre, said the Haitian mayors were searching for solutions in hurricane-prone south Louisiana, where community leaders have experience in emergency-planning and rebuilding strategies. “There’s also a cultural connection because we share a common Creole heritage,” Gustin said. Since most of the mayors in attendance speak only French, translators were on hand throughout the conference. Jordan Kellman, an associate professor of history at UL Lafayette, gave a presentation about Haiti’s and Louisiana’s shared heritage as former French colonies. “I talked about the emergence of a new generation of French speakers that is beginning to see itself as part of the broader French-speaking world. This is a new phenomenon in the French-speaking world. “When the Haitian mayors arrived, they were unsure about how the conference and its participants could help them. Part of the work of the conference was to begin to build a coalition of people with various areas of expertise,” he said. Shannon Strother, applied research and outreach manager for UL Lafayette’s National Incident Management Systems and Advanced Technologies Institute, presented information about NIMSAT’s development of Louisiana’s Business Emergency Operations Center. The center, which is activated during emergencies, coordinates communication and resources among public agencies, businesses and volunteer organizations. NIMSAT conducts research and develops technologies to improve disaster preparedness and response. “We were able to show them a model for cooperation between the public and private sectors,” said Strother. Paula Carson, UL Lafayette’s assistant vice president for institutional planning and effectiveness, was a conference facilitator. Carson said one of the mayors made a profound comment. “He said, ‘In many ways, we’re not reconstructing Haiti. We are constructing a country from scratch’,” she said. Even before the earthquake, Haiti was one of the poorest and least developed countries. Less than 30 percent of its population had access to electricity and about 80 percent of its citizens lived on less than $2 a day. Deforestation has left the once-lush landscape barren, undermining agriculture and making the region more vulnerable to natural disasters. Decades of political upheaval have also contributed to economic and social instability. “Traditionally, Haiti has been a centralized nation,” Carson explained. “The whole country was controlled in Port-au-Prince. Haiti’s largest employer is its federal government, which was also based in Port-au-Prince. Because all taxes and fees are collected and controlled by the federal government, local governments depend on it for their operations. “They are absolutely between a rock and a hard place,” Carson said of the mayors. “They’re faced with a myriad of problems with no clear solutions — not only any good solutions but almost no solutions at all. “The other thing we’ll have to help them put in place are metrics. Here’s where you are now and here’s where you want to be. How are you going to prove to the world that you’re making progress and that the monies that have been entrusted to you are being spent wisely? Carson said the primary goal of the conference fundamental: put the mayors in contact with one another to identify specific needs. “Local people know best what their communities need. There’s a great concern that if you abdicate responsibility for reconstructing your own country, it may not be built the way you want it to be built. That can present a real problem for the preservation of culture. “When the population becomes dispersed, settlement patterns change. You lose linguistic patterns, familial traditions, traditional ways of thinking and being. In the long term, those losses can cause great suffering to a country, as well.